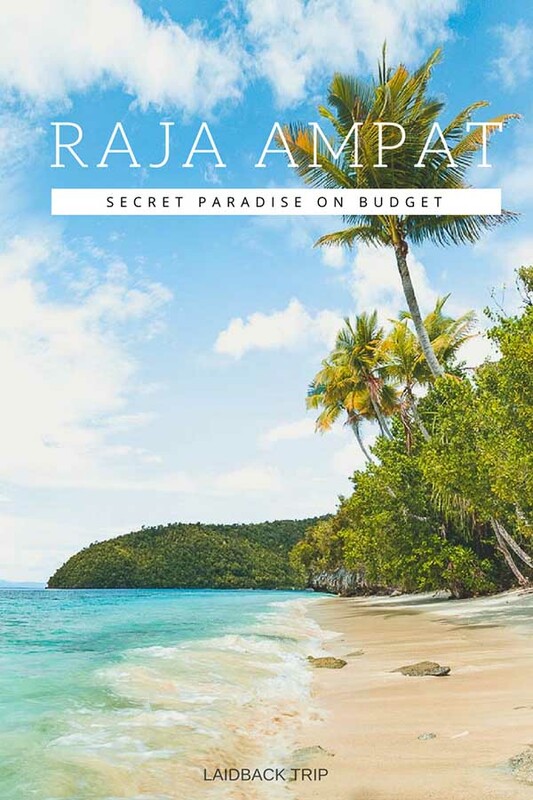 Raja Ampat is an Indonesian archipelago and because of its remoteness travel expenses are slightly higher than in other South East Asian destinations, but it is still possible to travel it on a tight budget. The tourism industry in Raja Ampat is on the rise, and prices slowly follow this trend. Business opportunities for locals expand when it comes to accommodation, food, and transport, and they are still learning how the tourism works, what level of service visitors require and how much it should cost. That said, prices are still reasonable, and cost of your stay will only depend on the level of comfort you are willing to pay for. We traveled independently, arranged everything by ourselves, stayed and ate in homestays, so the final cost was reasonable when we considering how remote Raja Ampat is. All total prices are calculated for 2 people. We visited Raja Ampat for two weeks, and without flight tickets and insurance, we spent $77 per day for both of us. We were snorkeling only and stayed in independent homestays, but if you plan diving trips and accommodation in diving resorts, it will cost you a bit more. The other thing is, we sometimes can live ascetically and don't feel an urge to buy snacks so add up $50 - 100 if you like treat yourself more often. Our journey to Raja Ampat started in Thailand. We flew from Phuket to Jakarta, and the ticket cost $110 per person. The roundtrip from Jakarta to Sorong was $200 per person. The similar cost will probably have to pay the majority of travelers as the route from Jakarta to Sorong is the most common way how to get to Raja Ampat. Then we flew back from Jakarta to Munich via Amsterdam for $678 each. As the Czech Republic is among 61 countries who can get Visa-On-Arrival at the airport, we paid $35 each for 30 days, and that was it. The entry fee to Raja Ampat Marine Reserve cost $100 per person. In Sorong, there is a variety of accommodation options. We spent the first and last night in a hotel near tourism office for $40 per night. On islands, we stayed in homestays where we also had a full board included, and the average price was $20 per person per day in a simple bungalow. Nowadays it is possible to make reservations online in advance for the set price. If you are making a reservation on spot, you can try to negotiate and get a better deal, but they might be sold out. You can also choose from more luxury resorts, or you can stay aboard on a yacht, rates are public on company's websites. From the airport in Sorong, we walked to the hotel nearby and didn't have to pay for a taxi. The other day we took a cab to get to the port, which was around $5. Public ferry from Sorong to Waisai cost $8 per person, and in Waisai we met a guy who owned a homestay on Friwen Island, where he sailed us for $35 per boat. Shared transport to other three islands we visited after (Kri, Piaynemo, Arborek) and back to Waisai cost very similar $30 - $40 each way. Try to find at least four people to share the boat with otherwise you'll have to pay the full rate. Our accommodation in homestays included breakfast, lunch, and dinner, so there was no need to go somewhere else. At the time of our visit, there were no restaurants apart from those in homestays. To be completely honest, at the end of our stay we were craving for a meal without rice and fish. At the time of our visit, there was a possibility to buy some snacks, ice cream or beer on Kri, and there was also a small shop stall on Arborek. Limited options mean no extra expenses and because we can live two weeks on a modest diet, it wasn't such a big deal for us. The only thing we missed was fresh fruit. Except for accommodation, island hopping, snorkeling, and diving trips will probably cost you the most on Raja Ampat. You can take own gear with you or borrow it. Snorkeling gear is not expensive, around $3 per day, diving equipment is approximately $40. A trip to see mantas from Arborek was $35 for a boat for 5 or 6 passengers. A kayak on Piaynemo was in the homestay rate. Other short sails to open sea snorkeling spots near islands cost around $10 per person. We didn't have to purchase anything extra for this trip. Generally speaking, you must only invest and have swimsuit which was our outfit almost 24/7 and waterproof sunscreen. Again, insurance is a must wherever we go. This trip was included in our six months travel insurance, and we paid $265 per person.